Congratulations to Hale and Eden for winning 1st prize in the Digital Incarnate Student Response Show. As first prize winners, they will receive a $100 award. Students, Faculty, Staff, and Alumni — Do you have news about your practice to share with the InterArts community? If so, here's how to get your news posted to the department Facebook page and this News page! Summer Equipment Cage Hours Revised! Please take note, the equipment cage hours are changing to accommodate the new summer school class schedule!! Equipment cage will now be open on Mondays from 3-7 (instead of 5-10). Friday hours (1-5) remain the same. Check Out Marilyn Sward Exhibition Photos on Facebook! It was an amazing event! So many people and such a great show. Many Thanks to all the folks who put this together! Join the InterArts Facebook Community today! 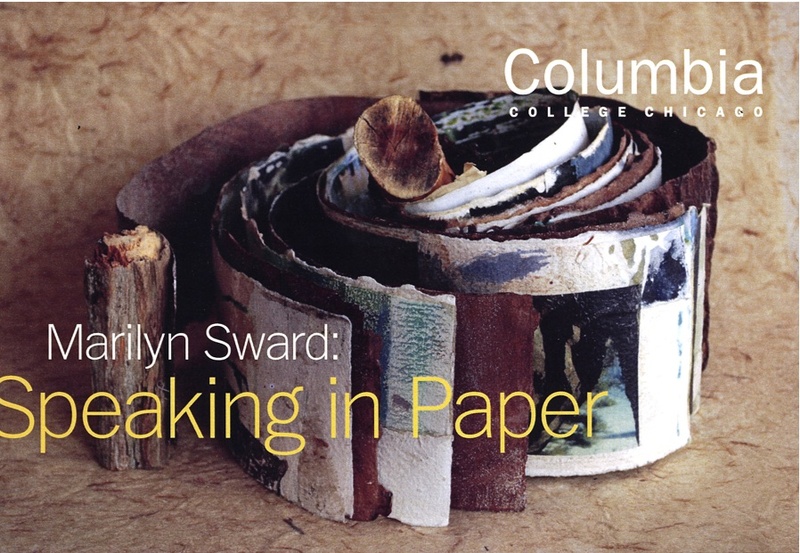 "Marilyn Sward: Speaking in Paper." Columbia College Chicago Center for Book & Paper Arts exhibit opening Wednesday, June 9, at 5 p.m.